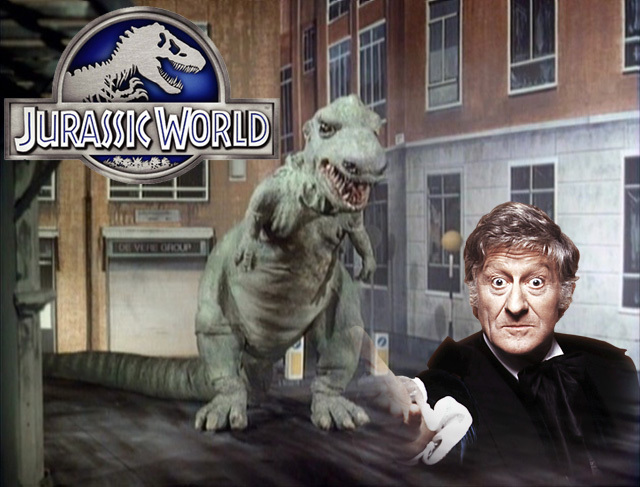 Prehistoric Week: Doctor Who's Jurassic World | Warped Factor - Words in the Key of Geek. "The hallmark of a true fan is that they develop a very personal relationship with the thing they adore. They don’t love everything about it equally, and the things they don’t like, they REALLY don’t like. It’s a good way to filter the true Whovians from the take-it-or-leave-it Who newbies, or Whobies, as they probably are not called." It would seem this is a feature of Spielberg's fandom, with the caveat that as a general rule the classics have always set the benchmark. "He still prefers the older stories to the relaunched series." And his company, Amblin, had an interest in the proposed Nineties Eighth Doctor TV series, ultimately postponed following poor American viewing figures. Indeed, footage credited as being a special effects test for a Dalek intended for that very project once appeared on Gamesmaster! Amblin's absorption into DreamWorks appears to have been the nail in the coffin - though a glance at the "trivia" section dedicated to the TV movie throws up an interesting point of contention from the esteemed director's point of view. "When an early script featured the Doctor in World War II battling Nazis in search of an ancient artifact, Spielberg pulled his support, saying it was getting to be too much like Indiana Jones. Fearful that the production deal might fall apart, the American producers didn't tell the BBC that Spielberg's Amblin studios were no longer involved until after production was under way and it was too late to back out." Ominously given the pop charts of the time it wasn't the glam rock T-Rex the Doctor would be doing battle with. He did, though, come across the children of an extreme green revolution as Operation Golden Age and its major players came to the fore. DOCTOR: There we are. Right, now let's review the situation. 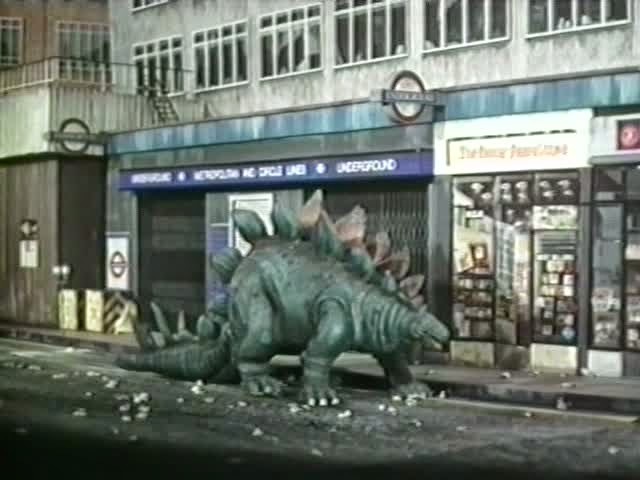 A prehistoric monster's turned up in central London. SARAH: Well, how how do you know it's only central London? DOCTOR: Because those soldiers were talking about the central zone, weren't they? SARAH: But where did that monster come from? DOCTOR: That's a very good question, Sarah. SARAH: Suppose there was an egg, buried in the ground somewhere, and somehow or other it hatched out? DOCTOR: What, producing a sweet little baby monster? SARAH: Yes. Ah. No. No, how would it grow to that size without anyone noticing. 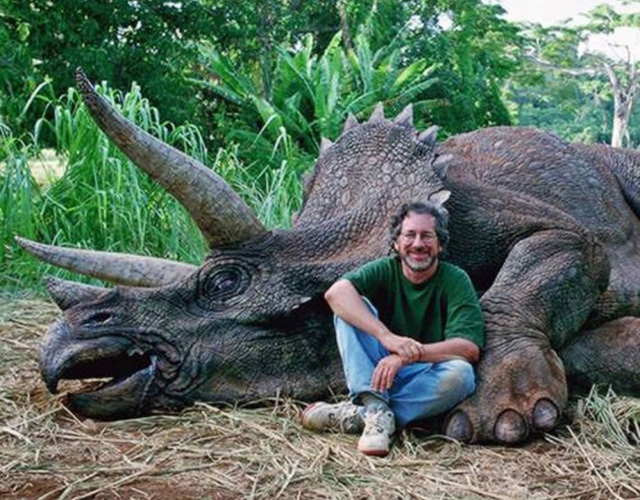 DOCTOR: Perhaps somebody kept it as a pet and turned it out when it got too big to feed. DOCTOR: Anyway, aren't you forgetting that pterodactyl that attacked us in the warehouse? SARAH: I suppose you've got the explanation, then. DOCTOR: Yes, as a matter of fact, I think I have. Not that General Finch- head of the Army- cares a jot. He's one of the Golden Age-rs, alongside former UNIT man Mike Yates and Charles Grover, a Minister with Special Powers. All of which might sound familiar if you followed the Green Party on the election trail! Though of course they stopped short of attempting to return man to a pre-technological state, depending on your point of view on such issues you might actually find yourself approving of the Operation itself. BRIGADIER: This is the Doctor, sir, our scientific advisor. Doctor, this is the Right Honourable Charles Grover, Minister with special powers. GROVER: I do apologise for the interruption, Doctor. I realise how busy you are. DOCTOR: Well, I'm glad somebody does. GROVER: I understand you may be able to help us find a solution to this crisis. DOCTOR: Yes, I sincerely hope so. Aren't you the chap who started the 'Save Planet Earth' society? GROVER: I had something to do with it. DOCTOR: You also wrote that book, Last Chance For Man, didn't you? DOCTOR: Oh, my dear Grover, I'm delighted to meet you. This planet needs people like you. BRIGADIER: Yes, of course. You two have a great deal in common. The Doctor's very keen on this anti-pollution business. GROVER: And so should you be, Brigadier. It affects all our lives. "Hello! Are you a Silurian? Look, do you understand me? Well, what do your people want? How can we help you? How many are there of you? Tell us what we can do!" Admirable in the circumstances, you'll probably agree. DOCTOR: I spoke to it. And it understood me. LIZ: What was it like? DOCTOR: Reptilian. Biped. A completely alien species. LIZ: And it didn't attack you? DOCTOR: Liz, these creatures aren't just animals. They're an alien life form, as intelligent as we are. But lessons will be learned from the sorry end to matters there. DOCTOR: The Brigadier. He's blown up the Silurian base. LIZ: No! The government were frightened. They just couldn't take the risk. DOCTOR: But that's murder. They were intelligent alien beings. A whole race of them. And he's just wiped them out. Not wanting to see a repeat massacre, sending the perpetrators of the planned new age back to live out their days within their actual golden age may possibly be considered far crueller given what he had witnessed of that time in the early days of his First incarnation! GROVER: Civilisation has already destroyed man. It's time to make a fresh start. If we take the Earth back in time, we can guide man onto a better path. GROVER: Congratulations, Doctor. You're just in time to be present at the most important moment in the world's history. DOCTOR: On the contrary, I'm just in time to prevent an atrocity. BRIGADIER: Don't move, any of you! Benton! WHITAKER: No! He's reversed the polarity! SARAH: Well, where've they gone? DOCTOR: Back to their golden age. And I hope they like it.